The cabinet has backed a draft withdrawal agreement between the UK and the EU, Theresa May has said. The prime minister was speaking after what she said was a “long, detailed and impassioned debate” in a five-hour cabinet meeting. 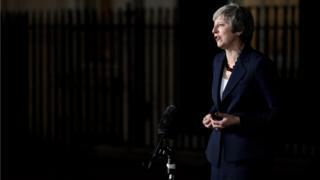 She said it was a “decisive step” in the progress of Brexit, and would allow the agreement to be finalised in the coming days. Conservative Brexiteers have already criticised what is thought to be in it. The draft withdrawal agreement – and a statement setting out what the UK and EU’s future relations will look like – are expected to be published by the EU later. Criticism of the draft agreement has focused on ways to prevent a hard border in Northern Ireland. Some Tory MPs are angry, claiming it could mean the UK is tied to EU rules for years to come. Despite winning the backing of her cabinet, the prime minister faces a battle to get the completed deal through Parliament. The Democratic Unionist Party – which gives the government the support it needs to win key votes – has joined opposition parties in criticising the anticipated arrangements.